Home BOLLYWOOD Watch: WWE Star Triple H Delivers Amitabh Bachchan’s Shahenshah Dialogue In Style! Watch: WWE Star Triple H Delivers Amitabh Bachchan’s Shahenshah Dialogue In Style! 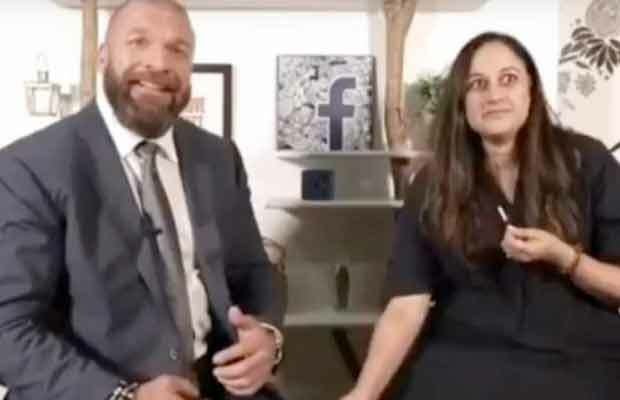 Triple H, on his visit to India, stunned everyone by saying Amitabh Bachchan’s dialogue! All of us know how amazing it is to watch the legendary actor Amitabh Bachchan deliver his iconic dialogue from the film Shahenshah. His heavy voice and his unique style makes the whole thing one of its kind. But recently there was someone else who delivered the same dialogue and stunned everyone by doing so. And it was none other than the WWE star Triple H.
The wrestler was in Mumbai recently, to promote a WWE event. Although he has not spent much time in India. But we guess that he had learnt enough Hindi to deliver Big B’s Shahenshah dialogue. And that also with utmost perfection! Talking about the work front of the veteran Bollywood actor Amitabh Bachchan, he is currently shooting for the film Thugs Of Hindostan. The film also stars Aamir Khan, Katrina Kaif and Fatima Sana Shaikh. The team has recently finished the Malta schedule. Big B is also going to be seen in a film called 102 Not Out in which he will be seen playing the role of a 102 years old man. The film will also be starring another veteran actor Rishi Kapoor who will play the role of his 75 years old son. Previous articleThe First Reviews Of Aamir Khan, Zaira Wasim Starrer Secret Superstar Are Out And It Will Force You To Watch The Film! Next articleInside Photos: Sidharth Malhotra, Alia Bhatt, Karan Johar, Gauri Khan And Others At Ekta Kapoor’s Diwali Bash!